CSA stands for Community Supported Agriculture. By paying in advance for a weekly delivery of harvest-fresh produce, CSA Members support the farm through their upfront investment in the all-natural, pesticide-free food they will receive during the growing season. During the growing season (June through November), Members receive a weekly share of the farm’s produce, delivered to a farmer’s market or pick-up site within 24 hours of harvest. Members are also invited to special farm days. This season Members may also pick four bunches of flowers at the farm. After Members’ shares are filled, we make produce available to farmer’s markets, restaurants and wholesale accounts. What size share should I get? This is a tricky question. How many nights a week do you cook? How many people are you feeding? How many of your meals are vegetarian? A small share is similar to our old “half share.” It is a good introduction to the CSA concept, and might be suitable for a small family, depending on your cooking style. It will usually contain at least four seasonal items. A large share is similar to our old “full share” and is probably about right for a family of three or four who like to eat vegetables and cook four nights a week at home. It will usually contain at least eight seasonal items. Do I have to pay for my CSA share all in advance? Payment plans are now available. If you don’t see a payment plan that works for you, let us know what would be comfortable for you. How do I get my weekly share? You pick up your share at a farmer’s market or a drop-off site. Look at the map and list of sites to select the one most convenient to you. What will I receive in my share as the season progresses? Can I specify what produce comes in my share? Our Harvest Calendar gives you a general idea of what your share might include, depending on the weather and growing conditions. If you are picking up at a farmer’s market, you choose your items from the produce available. Members always get priority, so limited items may not be available to non-member market customers. Strawberries, for example, usually sell out to Members only. This season we are continuing with a new program called “Harvie” for our pick-up sites. When you sign up for a Harvie site, you will choose your pick-up location and your share size. Then you will rank the vegetables on a scale from “never” to “I love it.” Harvie then designs your box. Each week it gives you the opportunity to adjust the selections – and, if you wish, to augment your box with additional items. For example, if you are having a party, you might need two more head of lettuce and another watermelon. Those items will be charged to your account. Can I split my share with a family member or friend? Yes, you just figure out who picks up and who gets what each week. You may have a neighbor, friend or family member come and pick up your share. Harvie will allow you to put your share on hold and add the items other weeks. If you forget to put your share on hold, we will donate the share. Can I switch share types in mid-season? You can switch from small share to large share, but not from large to small. May I cancel and receive a refund? 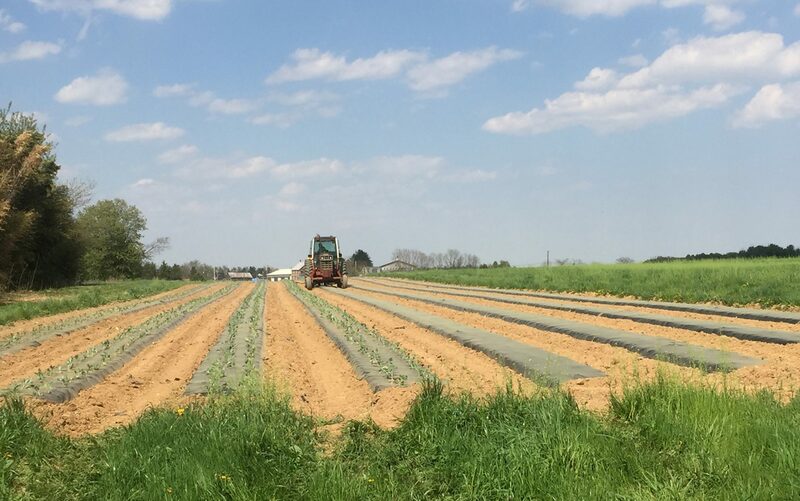 Once you join the CSA, your spot is secured for the entire growing season. What happens if I don’t pick up my share? For every ten shares at a site, the site earns one share to donate to a charity of their choice. If you do not pick up your share, it will be donated to your site’s charity. Can I make crop suggestions for the farm? Absolutely! We enjoy hearing from Members, especially about new crops you might like to try. Why should I eat produce in season? Seasonal eating means that you rely primarily on foods when nature makes them available. When you join a farm CSA, your body gets accustomed to being in tune with the rhythms of nature. You feel healthier because you’re eating the freshest food available, grown in harmony with the Earth. You’ll find it’s tastier, too! How will I learn to prepare the produce I receive each week? Follow this link to our pages of preparation tips and delicious recipes to enhance your table. Some are old favorites of our family, others we have created to make the best use of our seasonal produce, while others come from Members who have shared their cooking successes with our One Straw Farm family. How do I join One Straw Farm as member and guarantee my CSA share?